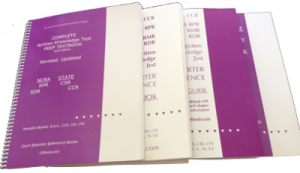 CRR Books & CDs has proven solutions for court reporters, court reporting students, CART captioners, teachers, and professionals: Books, CDs, tutoring, free articles to advance skills for national and state test prep certification material, real-time writing, captioning, CATapult software, dictionary building and vocabulary preparation. CRR Books & CDs publishes the HANDBOOK Series For Reporters And Captioners, by Monette Benoit, B.B.A., CCR, CRI, CPE and Emmett J. Donnelly, M. Ed., a succinct organization of critical material. This glossary development tool enables professionals to acquire a greater understanding of important events, facts and history. Once inside, you will research information in a well-structured format, enhancing your knowledge and job performance with these informational almanacs. These Handbooks are a necessity for reporters, CART providers, captioners, journalists, researchers, scholars, information specialists, news anchors, newsroom personnel, publishers, writers, technical writers, attorneys, paralegals, librarians, instructors and students to report events, programs, conventions, meetings, Internet transmissions, cybercasting — any gathering where people share and create ideas, research projects and utilize multimedia technology. Save valuable research time with advance preparation. Federal legislation is increasing the demand for properly trained professionals. Vocabulary development is vital to ensure success in reporting and research arenas. These unique books contain structured content, which minimizes preparation time for topic specific projects; maximize your knowledge and minimize errors and untranslates. The Handbooks will familiarize you with each subject. 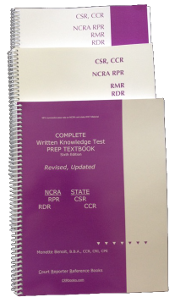 The handbooks are convenient to carry, each is 5-1/2″ wide, 8-1/2″ tall. Each fits in a briefcase or a computer case. They are the ultimate reference tools. The “Reporters Essential Tools” packet consists of five handbooks – available for immediate shipment. New words represent new experiences, new travels. They are symbols of items, objects, thoughts, memories. When you learn a word, you build a world; create an experience and capture a moment in time. Words represent who we are in life. How rich in experiences do you want to be? Pull up a chair. Create a great day for yourself. You have arrived at just the right moment! These Handbooks are available for immediate shipment. ORDER YOURS NOW! The Packet includes The Sports, Olympics, Security and Terrorism Handbook; The Universal Religions, Ethics, and Philosophy Handbook; The Environment, Weather, Sciences and Geology Handbook; The Politics, Elections, Government, Military and Criminal Handbook; and The A.D.A., Civil Rights, Affirmative Action, Business, and Convention Handbook. “You have to picture me with active children — each day. I’m always happy to give a testimonial about your products because they are all good. All my students, from way back, loved the dictation material “POPcorn Q & A” and the books ’WKT, CSR, RPR, RMR, RDR’ Text, Workkbook and Study Guides. Your Handbooks are great! And the Sports ’CATapult Your Dictionary’ CD is fun to work on.